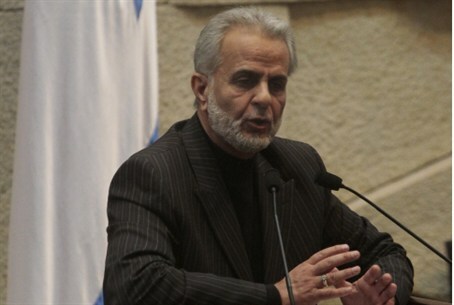 Arab MK Ibrahim Sarsour (Ra’am) met with several jailed terrorists, including one who was involved in the Park Hotel massacre in 2002. Arab MK Ibrahim Sarsour (Ra’am), known for his support of terrorism, has met with several terrorists who are currently serving time in Israeli prisons. In a statement he released, Sarsour said he made time in his busy schedule to meet with the three prisoners: Karim Younis, Abbas Al-Sayed and Lina Jerbouni. His statement, however, did not specify on what charges the three were convicted. Younis was convicted for his involvement in the 1981 murder of IDF soldier Avraham Bromberg. Jerbouni was sentenced n 2004 to 17 years in prison for her involvement in helping out the Islamic Jihad terror organization carry out terror attacks. Abbas Al-Sayed, a senior Hamas leader, was sentenced to no less than 35 years in prison for his involvement in a series of terror attacks, the most serious one being the 2002 suicide terror attack at the Park Hotel in Netanya, when 30 Israelis were murdered at a Passover Seder. MK Sarsour said in his statement that he spoke with Al-Sayed about the situation of Arab prisoners in Israeli jails, discussed with him the latest political developments, both regionally and internationally, as well as the how to thwart what he called "Israel's settlement policy, particularly in east Jerusalem." In the past Sarsour has called to establish an Islamic Caliphate centered in Jerusalem and has met with senior Hamas terrorists. He recently chose to condemn Israel for responding to Hamas rocket attacks from Gaza, while failing to condemn Gaza terrorists for firing the rockets.